This is a great concise two page close reading with interesting visuals and key concepts for social science clearly stated. The close reading has wide margins for annotation. It comes with an annotation guide. Key Common Core vocabulary for social sciences are bold throughout. 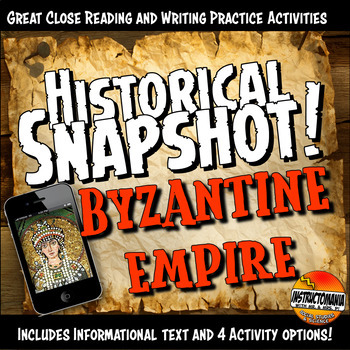 The reading details the rise and decline of the Byzantine Empire including: geography, trade routes, Theodora, Justinian, Justinian's Codes, Hagia Sophia and other major achievements. A new Welcome to Historic Istanbul (formerly Constantinople) Advertisement assignment was just added to this product. 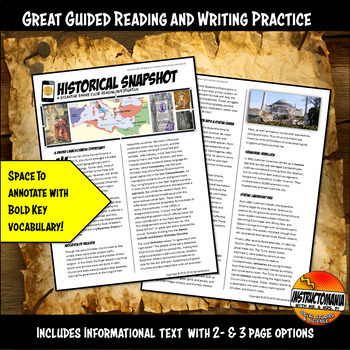 The leaflet graphic organizer comes with a handout, student write in template and a student example! For an extra homework, or further processing students complete a reading analysis Common Core worksheet. It includes an answer key!